Discovr – discover, play, and share music iPhone, iPod Touch, and iPad app makes following your favorite artists across several social networks and finding new favorites fun and simple. The sleek interface is certainly inspired by Apple Inc. with a spartan white background, concise text, and modern font. The social feed is sharp and easily navigated, but the real star of the Discovr iPhone app is the music map hidden in the sliding left menu. You are introduced to the Discovr iPhone app with horizontal swipes through several screens. 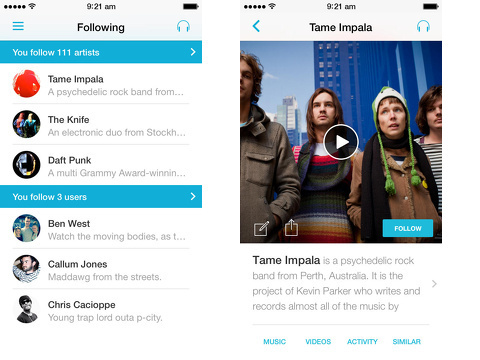 You sync accounts like Spotify, Rdio, Deezer, and last.fm. You can try a basic version without registration, or you can complete a process through email or Facebook. I used the email account log-in, and it automatically pulled up the artists on my iPhone Music for the opening feed. The fantastic social feed is filled with recent posts of your favorite artists from sources like Youtube, iTunes, & SoundCloud. Each item in the feed contains a photo relating to the artist or video. The icon of a post’s source is tucked into the lower right hand corner of photo. Below the photo, you will find title, performer, and who posted the content. You press play on the screen to start a song and play a video. If an article is posted about an upcoming show, with a tap, the article will open in the next screen. It’s visually much more attractive and efficient than keeping up with various YouTube channels. For each item in the feed, there is an opportunity to interact socially. Like Tumblr, there is a social synopsis of Discovr users who like a video. There are four icons to engage. A touch on the retweet icon reposts the content to your feed. The heart icon is a like. The convo icon opens the interface to comment. To share, the options are awesome. You can add to your Discovr radio player; open link in Safari; and share to Twitter, Facebook, email, and Messages. The player – your personal playlist – is a cool feature and is easily accessible by pressing the headphones icon in the upper right hand corner. The sliding left hand menu leads to the coolest feature of the Discovr iPhone app – the music maps. You enter a band, then an interactive graphic of related music groups appears. A photo of the band you entered is in the center and lines to five or six similar bands extend from it. The name of the band and its photograph adds a bold visual statement. 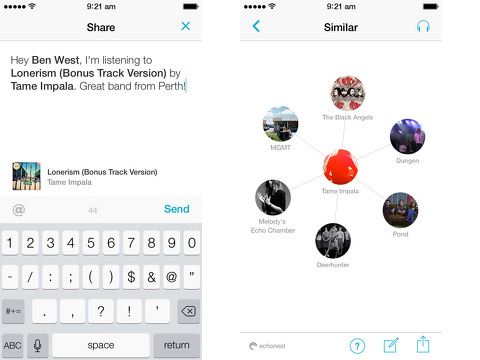 A single tap on a suggested band’s photo leads to a larger map, as the group’s comparable artists expand from it. You can slide your finger around the screen as it expands, and you can pinch and zoom to get a closer look at the photos. When you double tap a band’s photo, you move to a post of that band. You can tap to follow; and you can also check out music, videos, activity, and similar activity by touching these words on the screen. You can share your map on Twitter, Facebook, email, and Messages. The Discovr – discover, play, and share music iPhone, iPod Touch, and iPad app is attractive, agile, and insightful. The music maps are wicked and cool, and they are worth the free iTunes App Store download alone. AppSafari review of Discovr – discover, play, and share music was written by Jenni Ward on October 17th, 2013 and categorized under App Store, Free, Fun, iPad apps, Music, Radio, Social, Universal, Video. Page viewed 4406 times, 3 so far today. Need help on using these apps? Please read the Help Page.